From holding and storing bottles to dispensing liquor and preparing cocktails we carry bartender tools that makes the job easier and faster. 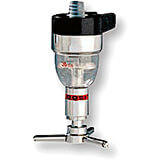 Bottle speed rails, shakers, strainers, specialty tools and more. 16.12" X 5" X 24"
26.38" X 5" X 24"
All Stainless Steel Bottle Opener, 8"
8" X 2" X 8"
All Stainless Steel Cocktail Strainer, 9.25"
The Paderno World Cuisine cocktail strainer is constructed of stainless steel. The rolled springs around the edge of the strainer keep ice off the pour, while allowing the passage of liquid and limited amounts of fruit pulp. 29" X 6-1/2" X 14-5/8"
This hanging Bottle holder / speed rail can hold up to seven liquor bottles and even other bar tools. The one-piece sturdy design keeps the bottles in place for maximum safety. 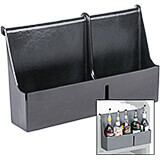 One hanging edge that runs along the back allows it to securely be mounted to any edge of your beverage bar. 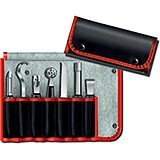 Victorinox Swiss Army 8-Piece Garnishing Kit (48997) contains: Vegetable Peeler. Butter Curler. Channel Knife. Melon Baller. Decorating Knife. 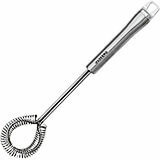 Apple Corer. Lemon Zester. Vinyl Case. The Non-Hydroscopic (won't absorb liquids) safe-grip, molded polypropylene handles safe up to 100°C / 212°F. 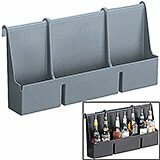 20-3/4" X 6-1/2" X 14-5/8"
This hanging Bottle holder / speed rail can hold up to five liquor bottles and even other bar tools. The one-piece sturdy design keeps the bottles in place for maximum safety. One hanging edge that runs along the back allows it to securely be mounted to any edge of your beverage bar. 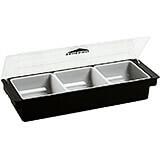 19.25" X 5.88" X 3.5"
The Paderno World Cuisine ABS plastic bar container has three storage compartments. Preparing multiple cocktails and drinks require organization. The container is designed to snuggle in the bar area while providing constant access to the necessary ingredients. 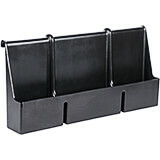 The Paderno World Cuisine ABS plastic bar container has four storage compartments. Preparing multiple cocktails and drinks require organization. The container is designed to snuggle in the bar area while providing constant access to the necessary ingredients. The Paderno World Cuisine ABS plastic bar container has six storage compartments. Preparing multiple cocktails and drinks require organization. The container is designed to snuggle in the bar area while providing constant access to the necessary ingredients. 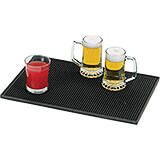 Black, Plastic Bar Mat, 17.75" X 11.88"
The Paderno World Cuisine 17 3/4 in L. by 11 7/8 in W. bar mat is the perfect work surface for any bar. The skid resistant mat eliminates glass breakage by gripping glasses and the mat even cuts down on cleaning time. 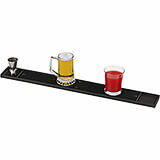 Black, Plastic Bar Runner, 26.75" X 3.13"
The Paderno World Cuisine 26 3/4 in L. by 3 1/8 in W. bar runner is the perfect work surface for any bar. The skid resistant mat eliminates glass breakage by gripping glasses and the mat even cuts down on cleaning time. 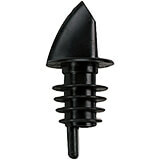 The Paderno World Cuisine black plastic bottle pourer dispenses free flow of liquids. The pourers are packaged twelve pourers to a bag. 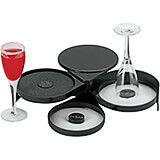 Black, Plastic Glass Rimmer, 13"
The Paderno world Cuisine glass rimmer is designed with 3 separate 6 1/2 inch salt trays. The rimmer is used to coat cocktail glass rims with salt for margarita cocktails. 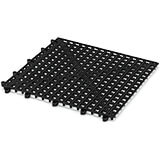 Black, Plastic Skid Resistant Bar Mat, Square, 5.88"
The Paderno World Cuisine 5 7/8 in square bar mat is the perfect work surface for any bar. The skid resistant mat eliminates glass breakage by gripping glasses and the mat even cuts down on cleaning time. 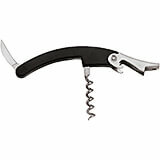 Black, Stainless Steel Bottle Opener, 7.75"
Black, Stainless Steel Waiter Corkscrew, 2.5"
Waiter's Corkscrew Experienced waiters pull out this foldable device out of their pocket and uncork a wine bottle in no time. 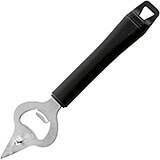 The blade slits the foil, then the drill penetrates the cork in a few revolutions. 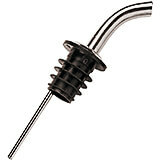 The end lever rests on the edge of the bottleneck and in a swift pull, the cork is extracted!. The Paderno World Cuisine blue plastic bottle pourer dispenses free flow of liquids. The pourers are packaged twelve pourers to a bag. 8.75" X 3.25" X 3.25"
The Paderno World Cuisine 18 1/2 oz. 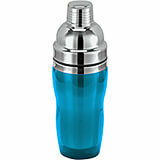 stainless steel and blue San plastic cocktail shaker is comprised of two pieces: the container and a cap. 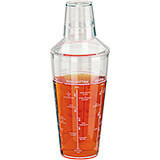 The unit is used to mix beverages by shaking. 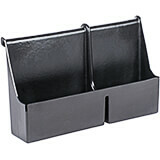 Material: San Plastic.Capacity: 0.57 Qt. 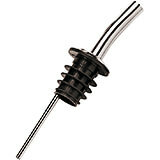 Chrome Steel Wine Drop Catcher, Chromed, 1.5"
The Paderno World Cuisine chromed wine drop catcher is an extremely convenient ring that sits on the neck of a wine bottle, discreetly catching the last drop after serving. 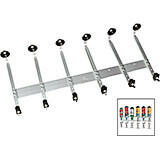 17.75" X 12.5" X 2.12"
The Paderno World Cuisine chromed ceiling glass rack can be mounted on a ceiling or under a counter. It holds approximately 20 glasses. 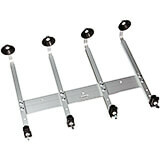 The Paderno World Cuisine chromed wall glass rack can be mounted on a wall. It holds approximately 20 glasses. 10" X 10" X 27.5"
The Paderno World Cuisine 1 oz. bottle pourer/dispenser is designed to fit on an alcohol bottle which in turn, is mounted on a bottle rack. This bottle pourer pours measured portions of alcohol. 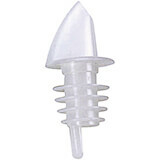 Size: 30 cc or 1 oz.Material: Plastic.Capacity: 0.03 Qt. The Paderno World Cuisine 1 1/8 oz. 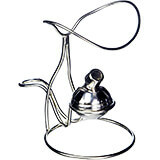 bottle pourer/dispenser is designed to fit on an alcohol bottle which in turn, is mounted on a bottle rack. This bottle pourer pours measured portions of alcohol. Size: 35 cc or 1 1/8 oz.Material: Plastic.Capacity: 0.04 Qt. The Paderno World Cuisine 1 3/8 oz. 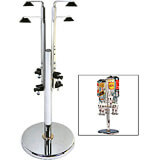 bottle pourer/dispenser is designed to fit on an alcohol bottle which in turn, is mounted on a bottle rack. This bottle pourer pours measured portions of alcohol. Size: 40 cc or 1 3/8 oz.Material: Plastic.Capacity: 0.04 Qt. The Paderno World Cuisine 1 5/8 oz. bottle pourer/dispenser is designed to fit on an alcohol bottle which in turn, is mounted on a bottle rack. This bottle pourer pours measured portions of alcohol. Size: 50 cc or 1 5/8 oz.Material: Plastic.Capacity: 0.05 Qt. The Paderno World Cuisine 5/8 oz. bottle pourer/dispenser is designed to fit on an alcohol bottle which in turn, is mounted on a bottle rack. This bottle pourer pours measured portions of alcohol. 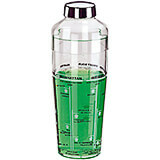 Size: 20 cc or 5/8 oz.Material: Plastic.Capacity: 0.02 Qt. The Paderno World Cuisine 7/8 oz. 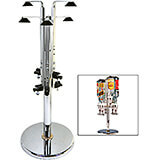 bottle pourer/dispenser is designed to fit on an alcohol bottle which in turn, is mounted on a bottle rack. This bottle pourer pours measured portions of alcohol. 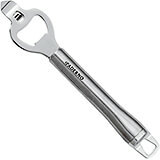 Size: 25 cc or 7/8 oz.Material: Plastic.Capacity: 0.03 Qt. The Paderno World Cuisine repetitive controlled 1 oz. bottle pourer pours measured portions of alcohol in a repetitive sequence, as long as the bottle is upside down, allowing for increased speed while preparing multiple drinks at once. Material: Plastic.Capacity: 0.03 Qt. The Paderno World Cuisine repetitive controlled 1 3/8 oz. bottle pourer pours measured portions of alcohol in a repetitive sequence, as long as the bottle is upside down, allowing for increased speed while preparing multiple drinks at once. Material: Plastic.Capacity: 0.04 Qt. The Paderno World Cuisine repetitive controlled 1 5/8 oz. bottle pourer pours measured portions of alcohol in a repetitive sequence, as long as the bottle is upside down, allowing for increased speed while preparing multiple drinks at once. Material: Plastic.Capacity: 0.05 Qt. The Paderno World Cuisine repetitive controlled 5/8 oz. bottle pourer pours measured portions of alcohol in a repetitive sequence, as long as the bottle is upside down, allowing for increased speed while preparing multiple drinks at once. Material: Plastic.Capacity: 0.02 Qt. 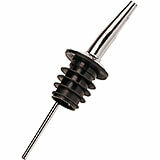 4.5" X 0.75" X 0.75"
The Paderno World Cuisine nickel/plastic curved shot pourer dispenses free flow of liquids. 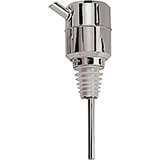 The Paderno World Cuisine nickel/plastic straight shot pourer dispenses free flow of liquids. 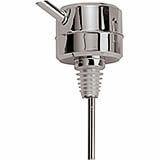 The Paderno World Cuisine nickel/plastic tapered shot pourer dispenses free flow of liquids. 9" X 3.25" X 3.25"
The Paderno World Cuisine 14 1/4 oz. clear acrylic cocktail shaker is comprised of two pieces: the container and a cap. The unit is used to mix beverages by shaking. Material: Acrylic.Capacity: 0.44 Qt. 9.25" X 3.75" X 3.75"
The Paderno World Cuisine 22 3/8 oz. clear acrylic cocktail shaker is comprised of two pieces: the container and a cap. The unit is used to mix beverages by shaking. Material: Acrylic.Capacity: 0.69 Qt. 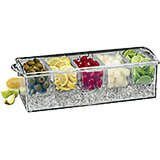 The Paderno World Cuisine clear plastic bar container with an ice drawer contains five storage compartments. Preparing multiple cocktails and drinks require organization. The container is designed to snuggle in the bar area while providing constant access to the necessary ingredients. The Paderno World Cuisine clear plastic bottle pourer dispenses free flow of liquids. 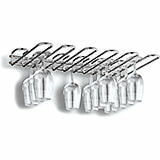 The pourers are packaged twelve pourers to a bag. Spare 16 7/8 oz. 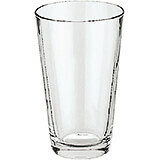 glass for the Paderno World Cuisine 16 7/8 oz. 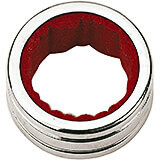 stainless steel cocktail shaker Material: Glass.Capacity: 0.52 Qt.